Work for QlikView for Life Sciences? Learning about QlikView for Life Sciences? Surely what I had like the most is the easiness of use, in terms of drilling each elements andh those soft colours that avoid the eye fatigue after many hours of use. I used this tool for months during my experience in the company and it was part of a software change from an oold one to a new one. I had to fight internally for the software Qlik choice but finally I had my reward with Qlik victory. 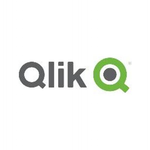 Finally Qlik was chosen as new software of data intelligence by the company. It was a great one! Have a deep view of the other softwares benefit and make a deeper software selection in order to bring those benefits to your company. Surely we had a wider view of the data we were using. In the past we had other experiences with other vendor but we did not found those good points and continuous enhancements that Qlik offers to their customers. With its continuous releases with new periodic improvements me, my company and my colleagues could say that we really feel coddle by the Qlik group. "Great performance and seamless integration"
"Qliksense although has drag and drop features, doesn't seem as flexible as Tableau"
You could easily perform ETL analysis in the back end with limited SQL knowledge. Basic SQL coding is a must, without which the whole package becomes a waste. Back-end setup is relatively easy. Dashboards and data visualization are extremely interactive. * We monitor all QlikView for Life Sciences reviews to prevent fraudulent reviews and keep review quality high. We do not post reviews by company employees or direct competitors. Validated reviews require the user to submit a screenshot of the product containing their user ID, in order to verify a user is an actual user of the product. Hi there! Are you looking to implement a solution like QlikView for Life Sciences?